Redeeming the Demon’s Daughter Live on Amazon! 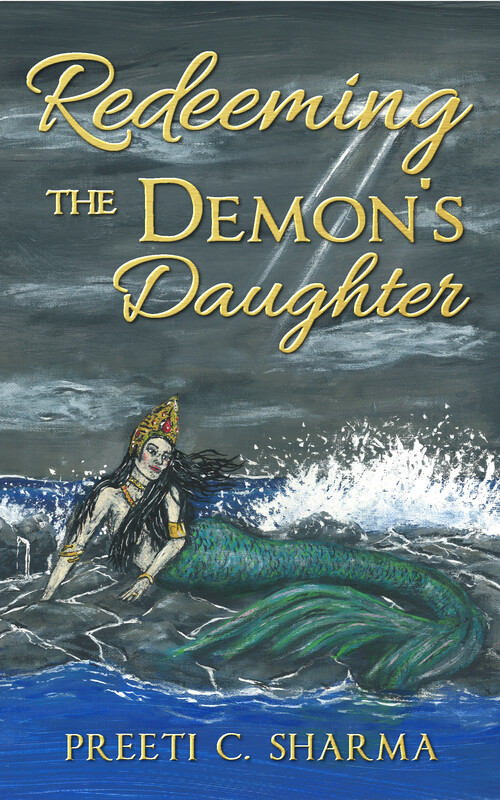 It’s so very exciting to announce the release of “Redeeming the Demon’s Daughter.” It’s out today on Amazon! This is a short story from the Hindu epic, the Ramayana. For those of you unfamiliar with the story, the Ramayana follows the story of the god-king Rama. The second of his father’s three wives wished her son to be king, so she requested her husband fulfill a promise to banish Rama. Rama’s wife, Sita, and another brother, Laxman, accompanied him on his 14-year exile. During his exile, the ten-headed demon Ravana kidnapped Sita and held her in his kingdom. An army, led by the god Hanuman, aided Rama in his battle against Ravana. Hanuman’s army attempted to build a bridge to Ravana’s kingdom by throwing large rocks into the ocean. Unbeknownst to Hanuman or his army, the rocks were carried away by mermaids. This is where my knowledge of the story diverges with other cultures’ versions: the leader of these mermaids is the daughter of the demon king. And in this version, Hanuman goes to investigate the reason his bridge project is being delayed, meets the mermaid, and they have a son. Hindu mythology is full of these holy conceptions, like the celibate sage that “met” a queen five times and blessed her with a child upon each meeting when she was barren. To fully appreciate the naivety, you have to see the serial television program, where the sage sends her a small flame. In the Hanuman stories I’ve heard, he too was celibate, and his sweat fell into the ocean and turned into his child. It seems slightly more believable that his half-fish child would be born of a mermaid. Anyway, in the Ramayana, we find out what happens to Rama, Sita, Laxman, Hanuman, Ravana, and even Hanuman’s son, but we never find out anything more about the mermaid. And when I learned about the story, it haunted me. There had to be more to the story of Suvarnamatsya (blame the Ramayana and the Sanskrit language for an entirely unpronounceable name). Suvi’s voice kept whispering in the background as I went about my business, telling me that she loved the son she lost. Because in the Ramayana we find that her uncle fostered her son and trained him to be a warrior. He also seemed to be on some accelerated growth pattern, since he was actually fighting in part of the war detailed in the Ramayana. So I took the information I found in the Ramayana and fit the pieces around a story that resolved Suvi’s story. I just couldn’t reconcile a love interest of Hanuman’s abandoning her child. So I made the sympathetic choices to figure out what might have happened in her life to result in that particular decision. And then all the rest of the pieces of “Redeeming the Demon’s Daughter” just fell into place. I hope you enjoy Suvi’s story—it really holds a piece of my soul. Like a Horcrux, but not evil.